NETWORK FINALS: FOX’s NASCAR race adjusted up to 1.0 in final numbers. CABLE HIGHLIGHTS: The season premiere of Starz’s OUTLANDER more than doubled its Season 1 finale (and also its series premiere), up an impressive two-tenths to 0.39. Unusually, ESPN’s NBA game beat ABC’s, 0.83 to 0.61, and it was for the obvious reason: ESPN had Golden State’s quest for a historic number of wins, furthered by its victory over Memphis. Adult Swim’s late-night animation line-up was uneven, with DRAGON BALL Z down 0.01 to 0.62/1.385M, DIMENSION W steady at 0.52, and PARASYTE also stable at 0.45, but SAMURAI CHAMPLOO down 0.05 to 0.37/856K, NARUTO down 0.11 to 0.32/779K, ONE PIECE down 0.09 to 0.27/649K, and KILL LA KILL down 0.05 to 0.27/640K. 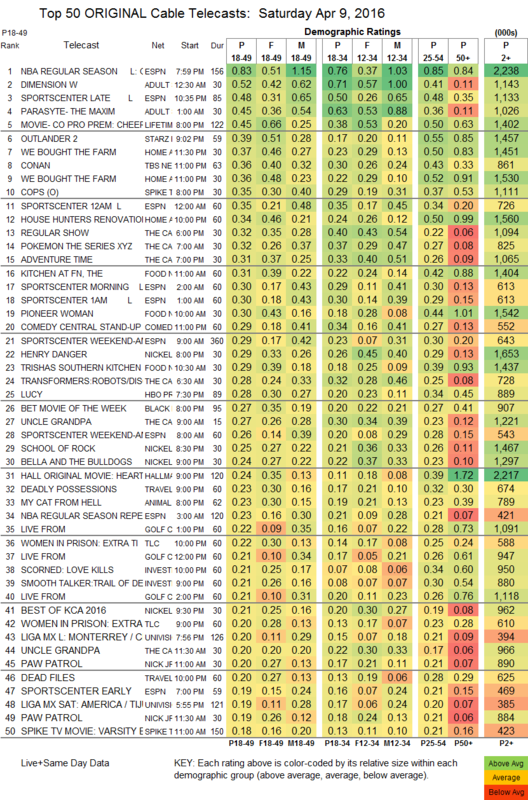 The Lifetime movie CHEERLEADER MURDERS was at 0.45,. while Hallmark’s movie HEARTS OF SPRING was at 0.24. On HGTV, 2 episodes of WE BOUGHT THE FARM were at 0.37/0.36, compared to last week’s 0.45/0.42. What must have been a special episode of TBS’s CONAN was at 0.36. Spike’s COPS returned at 0.35. On Food Network, KITCHEN AT FN rose 0.04 to 0.31, and PIONEER WOMAN was at 0.30, with TRISHA’S SOUTHERN KITCHEN up 0.02 to 0.29. A Nikki Glaser COMEDY CENTRAL STAND-UP special was at 0.29. Esquire’s BEOWULF stayed at 0.03/168K.